Lois Ellyn has been a noted contributor to the art of dance in Southern California over many years. She trained principally with Madame Nijinska, and Maestro Celli in New York. She toured Europe with The Marquis de Cuevas Ballet. 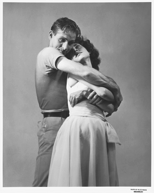 Master choreographer George Balanchine selected her for the New York City Ballet where she became a noted ballerina. Further, she toured internationally with celebrated ballet artists Mia Slavenska and Fredrick Franklin. In addition to her technical skills, her musicality and dramatic abilities are widely recognized. On the West Coast she was a popular and versitile Guest Artist and performed with Pacific Ballet Theatre, Ballet des Artes, Wenta Ballet and Joey Harris’ The Group among others. Returning to her southern California home she opened a successful school in Fullerton where she, while devoted to her students, still found time to perform. Together with her staff, she has prepared many students for careers in Dance and has fostered a strong appreciation of the Art for others. In the summer of 2001 she and a group of dancers returned to Fukui, Japan to perform Appalachian Spring. In 1988 she founded Nouveau Chamber Ballet. Miss Ellyn has frequently been invited to exhibit her choreographies at the Orange County Center for the Performing Arts Imagination Celebration where she has received four grants. Nouveau Chamber Ballet partners with Orange County schools to bring dance to life for school children. This includes onsite presentations in schools and visits to see staged ballets in the theatre.